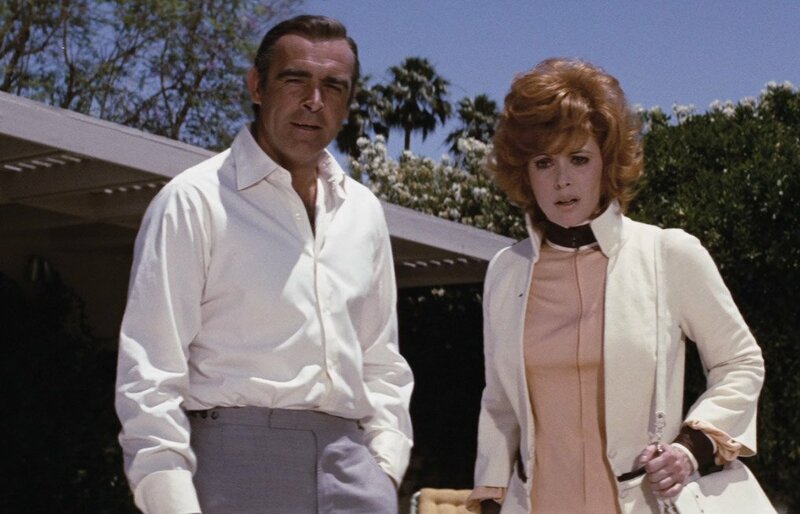 Anthony Sinclair’s release of a Goldfinger-inspired shirt with rounded double cuffs motivated me to take a closer look at the actual shirts that Sean Connery wears in Goldfinger. Terence Young, the director of the first two Bond films Dr. No and From Russia with Love, established the look of Bond’s wardrobe. 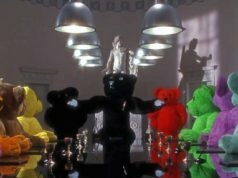 Goldfinger, however, had a new director, Guy Hamilton, and some of the wardrobe choices were different. Knitted silk ties replaced grenadine ties, the tailored clothes were more country than city since most of them came from Connery’s previous film Woman of Straw, and the shirts were different. Turnbull & Asser most likely did not make the shirts for Goldfinger like they did for all of Sean Connery’s other Bond films. Shirtmaker Frank Foster is a possibility, though Dr. No is Connery’s only Bond film he says he made shirts for. Click on the photo to enlarge and see the faint broken stripe on the cuff. Instead of just solid white, light blue and cream shirts like Connery wears in his other Bond films, Connery wears mostly striped shirts in Goldfinger. The dress shirts with both the off-white and black dinner jackets have a fancy white-on-white satin stripe pattern. With his suits, Connery’s shirts are all white with a faint broken grey stripe. The stripe almost disappears in most shots, but it’s visible in close-ups. And yes, the shirt with the famous light grey glen check suit is not solid white. It too has the faint broken stripe. The shirt that Sean Connery wears with his brown hacking jacket has the same broken stripe, but on ecru instead of on white. 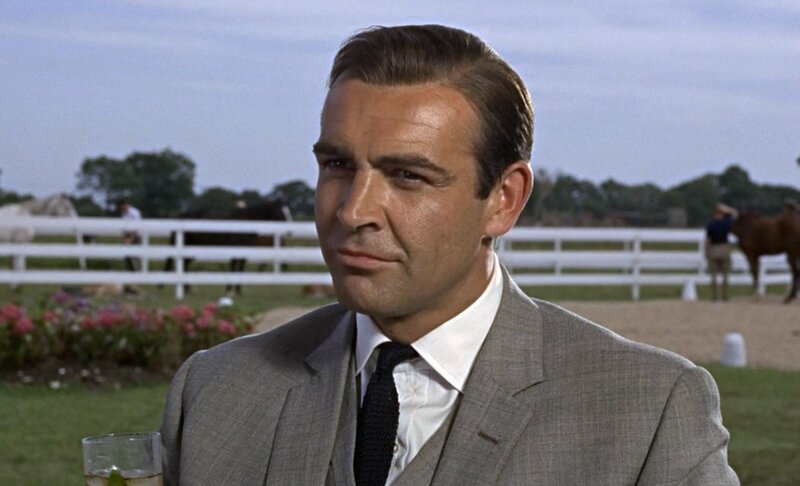 The shirts in Goldfinger have a classic English spread collar with approximately a 2 3/4″ point length and 3/8″ of tie space. The spread is around 5″ wide. The collar is made with a stiff sewn interfacing. Goldfinger is Sean Connery’s only Bond film that he does not wear cocktail cuffs in. Instead, he wears double cuffs (French cuffs) throughout the film. The double cuffs on the shirt he wears with his suits and hacking jacket have a rounded corner whilst the double cuffs on the shirts he wears with black tie have a large mitred corner, cut about halfway to the fold of the roughly 2 3/4″ deep cuff. Both the rounded corner and the mitred corner have the benefit of sliding more smoothly though the jacket sleeve than a square double cuff, which can snag on the inside of a jacket sleeve. Different style double cuff corners may possibly indicate different shirtmakers, though the cuffs appear to both be the same size and the link holes are in the same position. The link holes on all the double cuffs are around a 1/4″ off centre towards the fold, making them about 1 1/4″ from the fold. The cuffs are attached to the sleeve with shirring. 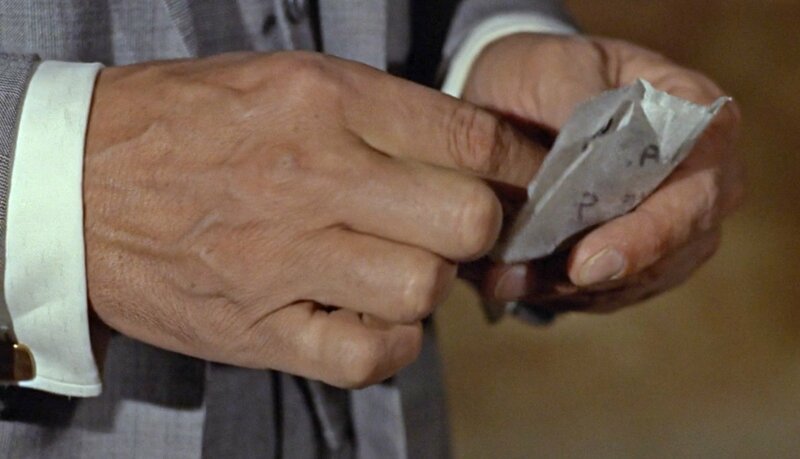 The plackets on the shirts in Goldfinger are slightly different than the plackets on the shirts in Connery’s other Bond films. See the image at the top. The placket is a little wider and stitched further from the edge than on the Turnbull & Asser placket. 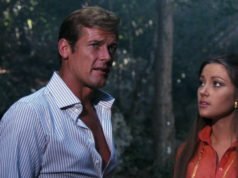 It isn’t identical, however, to the plackets that Roger Moore wears on his Frank Foster shirts in his James Bond films, which are stitched very close to the centre. 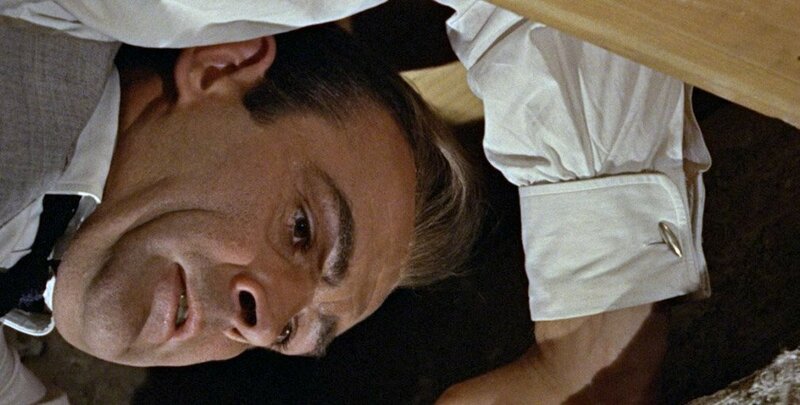 The placket on the Goldfinger shirts is identical to the placket that Roger Moore wears on his shirts in the two-part episode of The Saint titled “Vendetta for the Saint”, and that shirt was most likely made by Frank Foster. There’s more to the Goldfinger shirts than meets the eye. It’s too bad that only the dress shirt with the off-white dinner jacket in the pre-title sequence is the only shirt in the film we see without a jacket or waistcoat over it. The shirt has a much trimmer and cleaner fit through the body and the sleeves than the Turnbull & Asser shirts Sean Connery previously wore in Dr. No and From Russia with Love. Whilst the shirts in From Russia with Love have darts to shape the shirt through the waist, this shirt has a cleaner fit without darts. The Anthony Sinclair shirts are all offered with either a cutaway collar or a semi-cutaway collar, which is a spread collar similar to Connery’s collar. The Anthony Sinclair double cuffs are a little shorter than Connery’s double cuffs, and the link holes are centred rather than slightly off-centre towards the fold. Matt, I’d be curious to ask your opinion on wearing French cuffs as if they were barrel cuffs, ie the practice of folding the cuffs around the wrist, overlapping them into a circle shape and securing them with a cufflink rather than the traditional method of touching the two inside sections and forming a teardrop shape. I’ve noticed others doing it and I’m sure when typing at a desk it has slight advantages over the cuff sticking out. It looks less refined but then so does rolling up ones sleeves or undoing your top button and loosening your tie at the end of the day and that’s a common practice. Thoughts? I’m assuming Bond hasn’t done this. Bond has never worn his double cuffs like a barrel cuff. The exception is in Moonraker, when the double cuff is worn with a button to mimic the look of a cocktail cuff shirt that was presumably not available for the shot (https://www.bondsuits.com/dinner-suit-at-carnival/). Since the shirt is a stand-in, I’d hardly count this Bond wearing a double cuff like a barrel cuff. Double cuffs should never be worn as barrel cuffs. With proper cuff links, getting the link through would be impossible. With T-bar cuff links it’s much easier, but in either case the the cuff link inside the cuff will irritate the wrist. Wearing button cuffs or cocktail cuffs is the best solution for typing. I like Connery’s satin stripe shirt very much. It gives a fresh look to his black tie / white dinner jacket outfits. As to “double cuffs worn like barrel cuffs”: Although it’s against the “rules” I sometimes do it myself but only for practical reasons (in my office). Besides I have seen people wearing their double cuffed shirts like that when wearing a sweater over it. That makes sense because it’s difficult to wear a sweater’s sleeve over a French cuffed shirt which is fastened “according to the rules”. 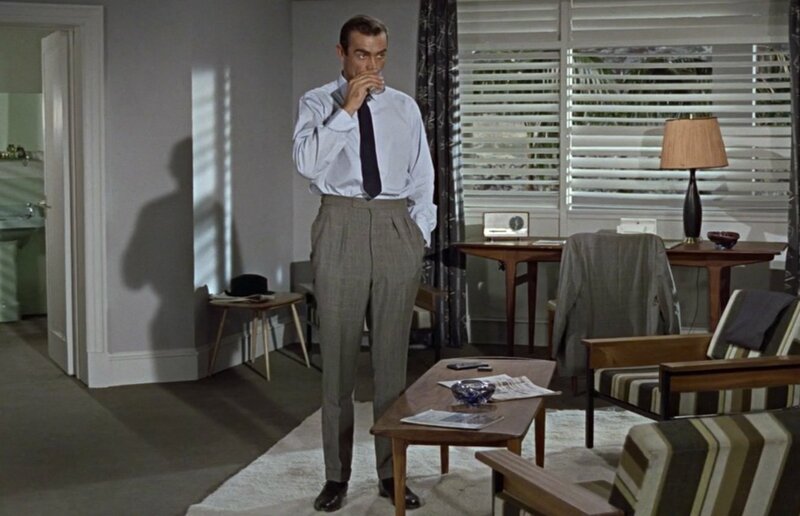 Would you say that the shirts in Goldfinger fit Connery better than his other shirts from, to take two examples, Dr.No and Diamonds are Forever? Are the shirts below a little bit too large? 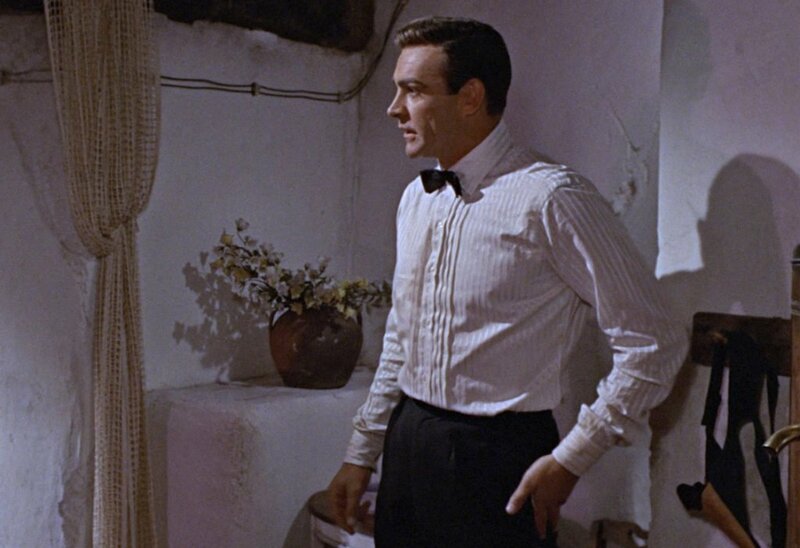 The shirts in Goldfinger have a trimmer fit because they’re not Turnbull & Asser. The Turnbull & Asser shirts in Connery’s other films fit him very well, they just have a fuller fit. It’s all preference. The dress shirt worn with the off white dinner jacket looks suspiciously like a Charvet Shirt . My Grandfather has a similar Charvet dinner Shirt from 1967 . No darts , white silk tonal stripe. No gaunlet buttons. But it seems very unlikely that they would use a French Shirt Maker in a Connery Era 007 film. Matt , is Charvet a possibility for the shirts in this film ? I don’t think they would use a French shirtmaker for a film made almost exclusively in the UK. On a related subject , does a shirt with Satin Stripes always have to be silk ? Or can it be pure cotton too ? Or is it a cotton shirt with only silk stripes ? Satin stripe shirts are typically pure cotton. Did they specifically say they made them or just give a picture and some hashtags? They share a lot of stuff they didn’t necessarily make but find stylish. They believe that all photos they post are photos of their shirts. They were involved with every Bond film through A View to a Kill.